Everyone has a credit score, and staying up to date on yours is important. Here, we showcase five free apps for your phone (Android or iOS) that will help you monitor your score, correct items when necessary, and get alerts when something changes on your report — even while you're on the go. A credit score indicates your creditworthiness to potential lenders such as banks and mortgage lenders. It indicates how responsible you're likely to be with paying off your balances. Credit is scored on a scale that ranges from 300 to 850. A higher number is better than a low one. The most commonly used credit score is the FICO score, but there are other models, such as VantageScore. Does Checking Your Credit Score Hurt It? Many people fear that checking their credit scores through services such as Credit Karma (or any of the other apps mentioned below) negatively affects those scores. The truth is that checking your own credit score is usually considered a "soft inquiry," meaning it doesn't require a "hard pull" of your credit report. "Hard pulls" (or "hard inquiries") typically happen when you apply for a new credit card, a loan, or a mortgage. "Soft pulls" typically occur when you check your own score, when a potential employer does a background check, or when you're pre-approved for a credit card or loan. Credit Karma does a good job of explaining the difference between types of credit inquiries. In any case, you should rest assured that using any of the apps below won't negatively affect your credit score. Upsells of financial products within the app. Credit Karma is perhaps the best-known service for getting free credit score reports from the Equifax and TransUnion credit bureaus (Experian is the other major bureau). 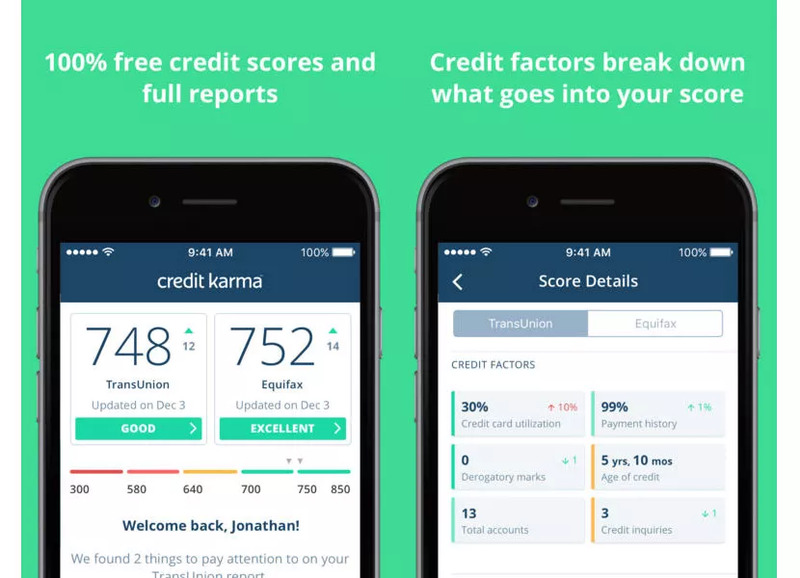 Its apps for Android and iOS provide alerts for any important changes to your credit report, and if you see any errors, you can file a dispute directly from the Credit Karma app. You also can view a well-organized summary of how your credit score breaks down and look at all the accounts that are being reported and factored into your score. This app from Capital One is available to everyone, not just the company's banking customers. 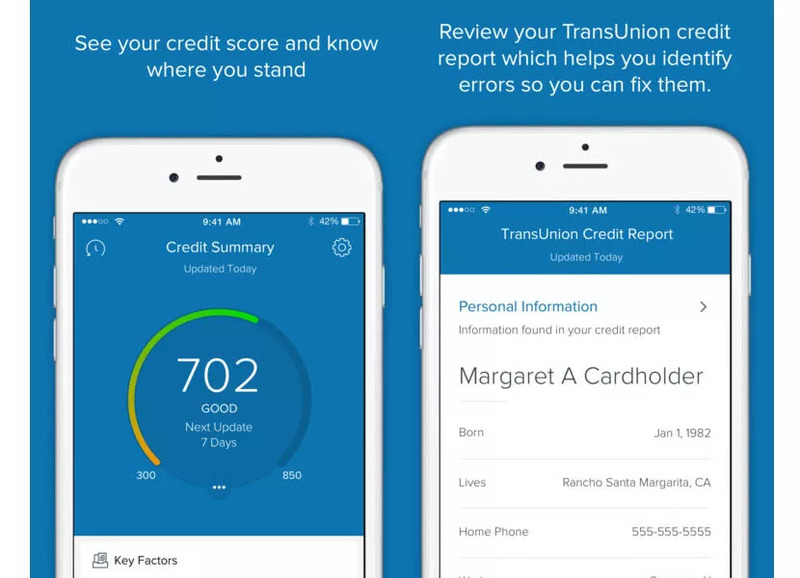 It provides a weekly update of your TransUnion VantageScore 3.0 (as opposed to FICO) credit score, and it includes some interesting extras such as a credit simulator that demonstrates how actions such as paying off debt could affect your score. You'll also get personalized suggestions for improving your score, along with the industry-standard alerts for any important changes. Push notifications on major credit events. The most commonly used score to determine your creditworthiness is FICO, so having an idea of where you stand is valuable. If you have a myFICO subscription for monitoring your score and getting reports (starting at $29.95 per month), this free companion app is a must-have. It shows you your current FICO score across all three credit bureaus and even shows how they've fluctuated over time. The app delivers push notifications when important changes occur in your report, such as a new inquiry or ​an increase/decrease in your score. As one of the three major credit bureaus providing credit reports, Experian quite sensibly has a credit score app of its ..READ MORE..